The characters are not loud or over expressive like most of our Bollywood movies. No humor or jokes to add spice. Its more of actions than words, strong short dialogues than endless conversations. 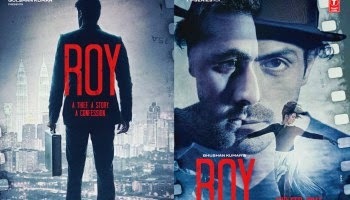 I totally enjoyed watching ROY and hats off to Arjun Rampal he has out done himself. His finest performance till date. Jacqueline Fernandez establishes herself as an actress by playing two different characters in a distinguishable style. However Ranbir Kapoor failed to impress me. His role demands him to be mysterious but his acting seemed lifeless. I could not really differentiate when he was happy or sad he just had a poker face all along. Anupam Kher has a short role, nothing much to say. If you have watched the movie, please share your thoughts am eager to hear them ! I liked the movie too. It has a very deep philosophy in it. Loved some scenes. Though they could have edited it a little more. Ranbir was disturbingly blank. While watching I was thinking that movie has a feel of a novel or novella. Roy was difficult to understand. I didn't enjoy the movie till interval. I was so confused that is Ranbir part of film being shot by Arjun Rampal. Or is Ranbir a thief trying to steal while the movie is being shot. Just before Interval, thanfully it got clear that Ranbir was in imagination. I thoroughly enjoyed the movie only because I have read interviews of Rowling and Jeffery Archer in past. I know when a writer creates a story with characters, the characters are stronger than the writer. That is why a writer can not change story on his own will. He has to obey with the personality and traits of the characters. Around interval, Arjun Rampal faces dilemma of changing the character of Ranbir from a thief to a lover. He can't do it and goes in writer's block. Later, he finds a trick wherein, Ranbir can play as thief and still get back to his love. Awesome story yet difficult. Thanks Pooja for the clear explanation, Yeah agree its slightly confusing. I haven't watched this movie, but I love Indian movies. So fun with the music, dancing and romantic. Thanks for visiting my blog. You wanted us to follow each other. Please how do I follow you? Are you serious....I found the movie utterly boring. It seems they tried copying some hollywood flick and miserably failed. Neither is it a proper love story, neither a art theft story and neither a movie making one which Arjun Rampal was doing. Punjabi gaana in Malasia ...really? And by a serious film maker ...the character that actress plays? I am a fan of bollywood movies, thanks for sharing your review. Really?? I haven't seen it yet but have heard negative reviews about it!